Photo by Jamie Bartosch/Suburban TravelingMom Stunning Buddhist temples are everywhere in Thailand. Families visiting Thailand with kids will experience an exotic, beautiful country and a fascinating culture. 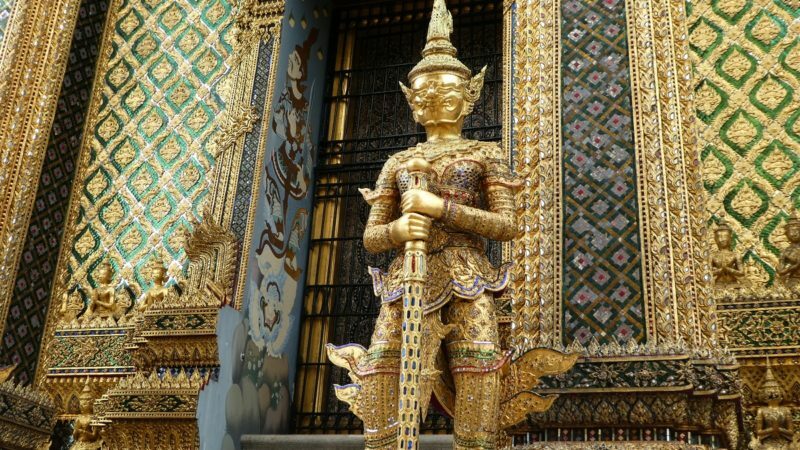 From riding elephants to trying out Buddhist customs, you will remember your time in Thailand for the rest of your life. It’s a spectacular destination for families with teens and multi-generational groups. Stunning Buddhist temples are everywhere in Thailand. Families who visit Thailand with their kids will have the experience of a lifetime. During our visit last summer (when it is crazy hot and humid), my 14-year-old daughter, my younger sister, and 76-year-old mom (girls’ trip!) had a truly extraordinary multi-generation vacation. I wouldn’t recommend it for young kids, but definitely for middle school ages and up. Because the Thai people are so kind and appreciative, even something like ordering fast-food will be eye-opening experience for kids. A KFC employee at the Bangkok airport gave my daughter her chicken nuggets by putting her hands in prayer, doing a quick bow, and saying “Kap Kun Kap” (thank you). It’s a typical Thai way of showing gratitude. We laughed at the thought of that happening in a fast food restaurant in the U.S. Ha! Here are nine of our most special experience in Thailand, which I’d recommend to families. 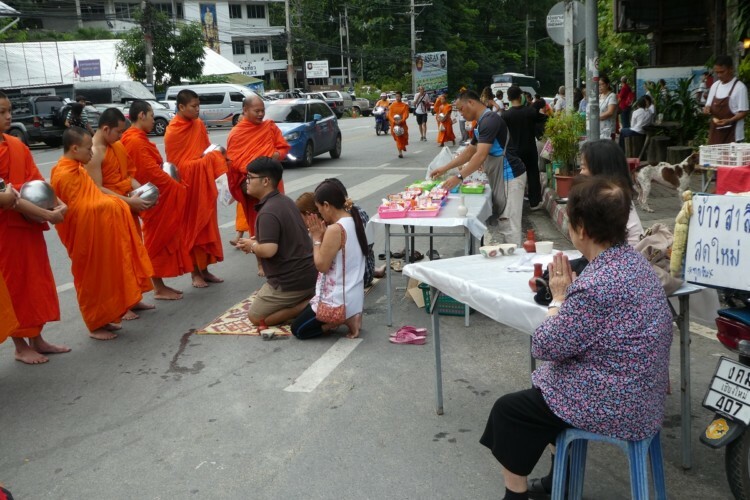 You can make an early morning offering to the Buddhist monks across Thailand. This is an authentic, cultural and educational experience which I loved. It’s done across Thailand – by Thai people, not just tourists – and its purpose is to instill gratitude and be a virtuous person. With legs covered and shoes removed, required as a sign of respect, we put our offering in their small bowls and kneeled in front of them. They chanted a 2-minute prayer as we poured water from one bowl to another. The ritual symbolizes how easily generosity flows from one place to another. Then we put our hands in prayer, and made a wish. It was a really special and genuine experience. I actually did it twice. I needed to make a second wish! 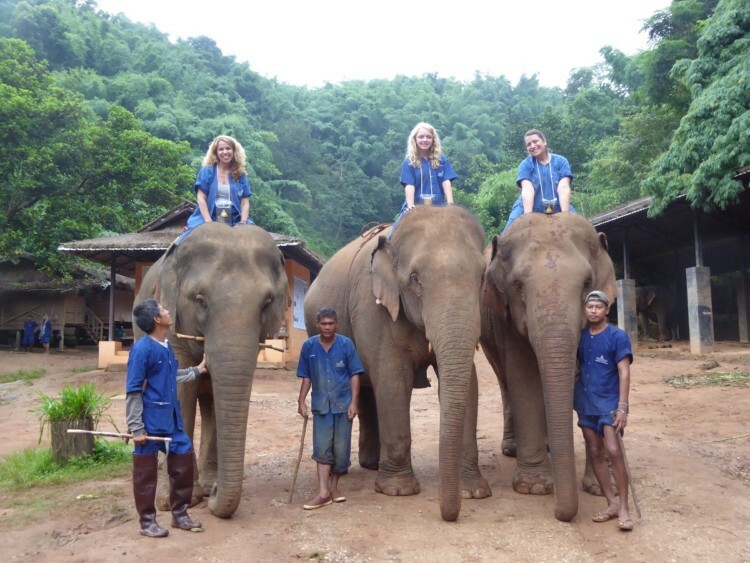 Riding elephants at the Anantara Golden Triangle Elephant Camp and Resort in Chiang Rai, Thailand. This is the quintessential Thailand tourism activity and photo op. A great place to do it is at the Anantara Golden Triangle Elephant Camp in Chiang Rai, a phenomenal, family-friendly resort in the northern part of the country. We had a medical emergency with my mom during our stay, and they couldn’t have been more helpful and kind to us. That’s the kind of place you wanna be when you’re staying in rural Thailand. 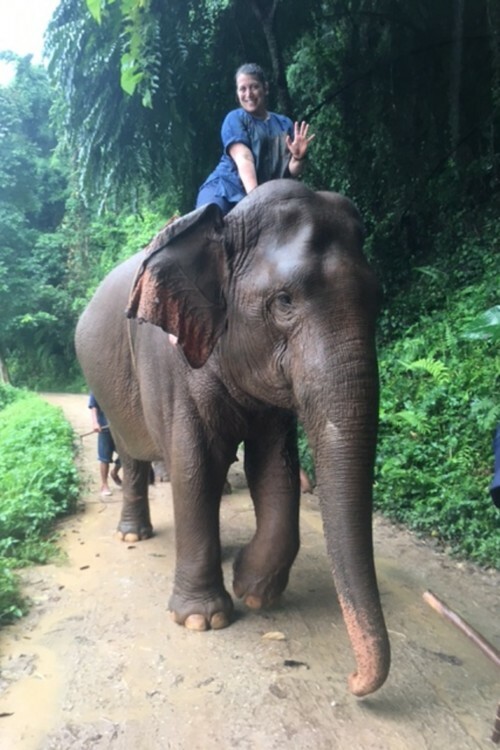 There is no saddle, or liability waiver to sign when you ride elephants. It’s kinda casual, since the elephants live on the property. The camp provides you with clothes to wear for the ride, so you don’t ruin yours (you WILL get dirty). To get on, the elephant bends its knee, you step up, and the staffers boost your bottom. During the ride, the staff took tons of photos and videos with our cameras, so we could just enjoy the ride. It was raining steadily as we rode, but it was such a fun experience! TravelingMom Tip: In Chiang Mai, there’s a cute store called the PooPoo Paper store, where all of the products are made out of elephant poop. We bought funny cards made from poop, and other funny “Precious Movement” souvenirs. Buy everything from noodle soup to knock off designer purses at the Dumnoen Saduak Floating Market, just outside of Thailand. Markets that stretch for miles are all over Bangkok. You’ll see many of the same foods, products and souvenirs at all of them. 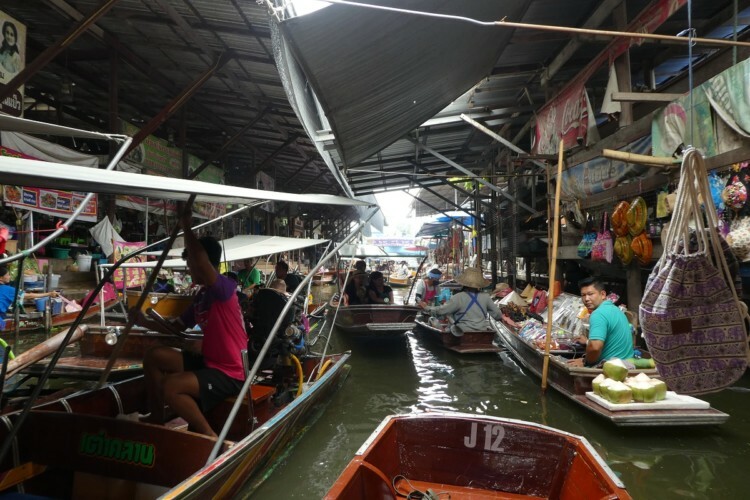 A unique market worth visiting is the Dumnoen Saduak Floating Markets. You ride a motorized canoe through the town’s canals, and then float up to stands or canoes selling food and souvenirs. We bought $2 noodle soup from a woman selling it from the heated metal bowl in her canoe. We bought some cute bracelets, too, for $1 each. TravelingMom Tip: Even though everything is inexpensive, you should still negotiate the price. 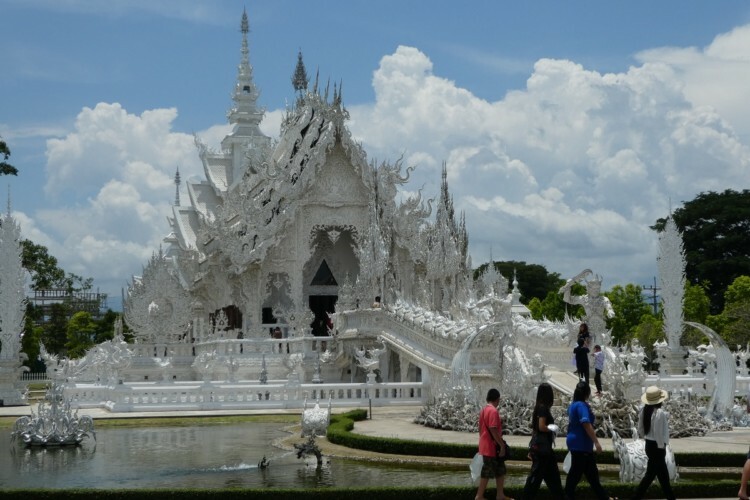 You’ll say “wow” out loud when you see the stunning White Temple in Chiang Rai, Thailand. Walking in to the White Temple in Chiang Rai, Thailand. You’re going to see a lot of beautiful Buddhist temples in Thailand (they’re called “wats”). 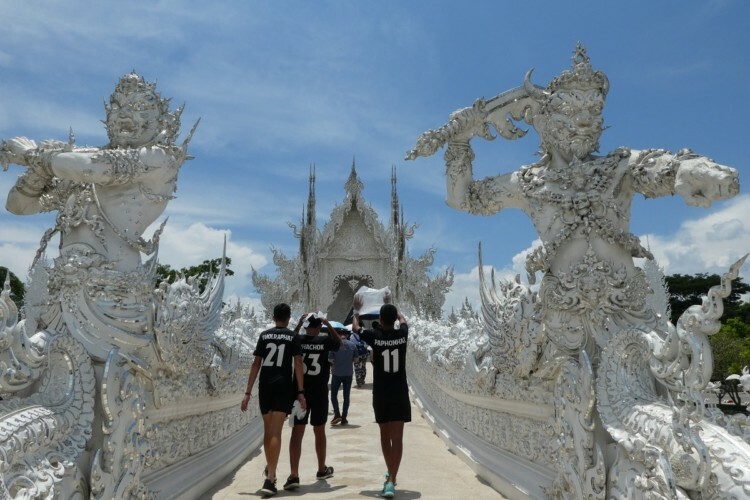 But in the far north part of the country is the White Temple, a stunning architectural all-white building that is worth the trip. I guarantee you will say “Wow!” out loud when you first see it. The interior contains a mural filled with pop culture icons – everything from superheroes to Osama Bin Laden. Even the bathrooms are ornate and fun to visit. TravelingMom Tip: Remember to keep your legs and shoulders covered when you enter Buddhist temples. Shorts and tank tops are not OK. Bring a wrap for your shoulders, and wear lightweight pants or a skirt that goes at least to your knees. Some temples have stands outside where you can buy a $3 wrap, but better to come prepared. Also, photos are not allowed in certain temples. To be respectful, ask before taking out your camera. 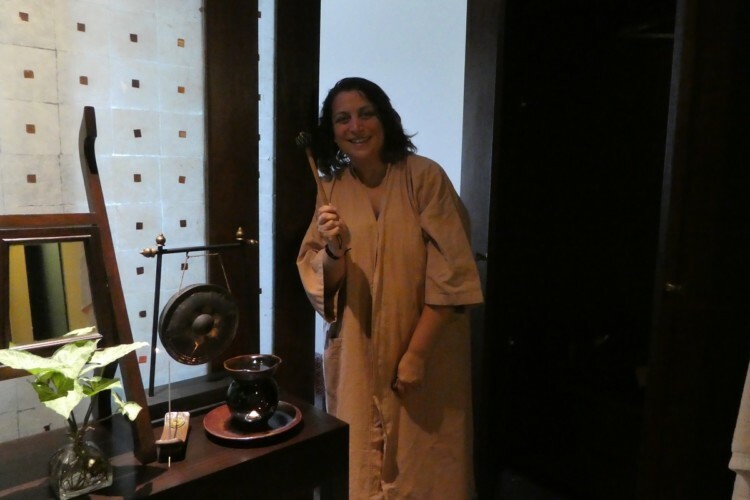 I used a gong to alert the staff that I was ready for my Thai massage at the Anantara Golden Triangle Elephant Camp and Resort in Chiang Mai, Thailand. Massage parlors are on nearly every block in Thailand, and a Thai massage is a unique (and cheap!) massage. It involves stretching you into different poses and holding them. They’re keep-your-clothes-on massages done in large rooms, so you can stay with the kids. Another option: 30-minute foot massages for less than $10. 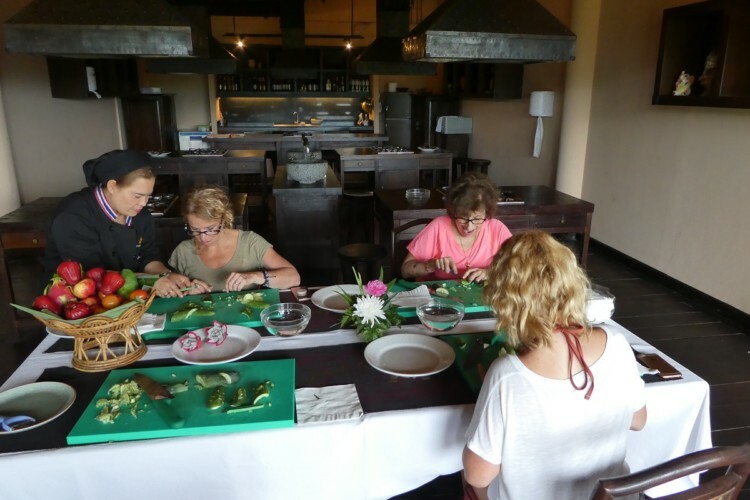 A fruit and vegetable carving class is a fun all-generations activity at the Anantara Golden Triangle Elephant Camp & Resort in Chiang Mai, Thailand. Ever been to a Thai restaurant and notice the intricately carved vegetables and garnish? That’s what you’ll learn how to do at Anantara’s food carving class. The chef taught us how to carve tomatoes, cucumbers, apples, dragonfruit and more. We ate our mistakes, and laughed really hard most of the class. 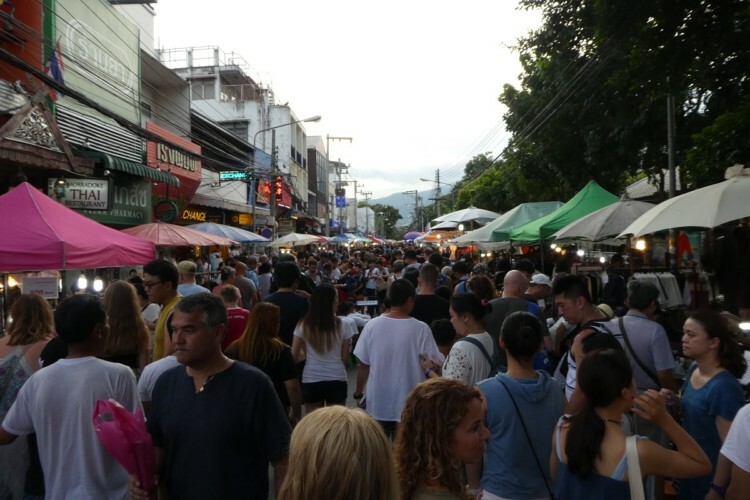 The crowded but awesome street markets are fun to visit in Bangkok, Thailand. Bangkok is famous for its massive night markets that stretch for blocks and blocks. They sell everything you can imagine, from noodles to designer knockoffs, and it’s all ridiculously cheap. Always bargain! Among my purchases: a $3 pair of fake Oakley sunglasses, some really cool bracelets (around $3 each), and much more. There’s often live music and people cooking. Just be warned: it can be very crowded. Buddhism is a beautiful religion. You will learn more about it while visiting Thailand’s many gorgeous temples. Take time to partake in the religious rituals. Learn about the different Buddhas, and find “your” Buddha based on your birthday (mine has seven snakes above its head, signifying that I’m a protector). In the temples, you can take off your shoes, kneel down and silently pray alongside the many Thai people who come even though it’s a tourist destination. For a few dollars, you can buy a lotus flower and incense stick and place it near your Buddha. Just remember to be respectful about taking photos, and follow the dress code (mentioned above). Thailand’s beaches are among the most beautiful in the world. While we didn’t have time to go, several TravelingMoms did and said they’re incredible. 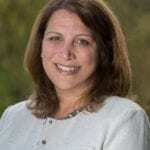 Read about Los Angeles TravelingMom Mimi Slawoff’s experiences here, and TravelingMom Meagan Wristen’s review of a great family-friendly beach resort in Thailand here. 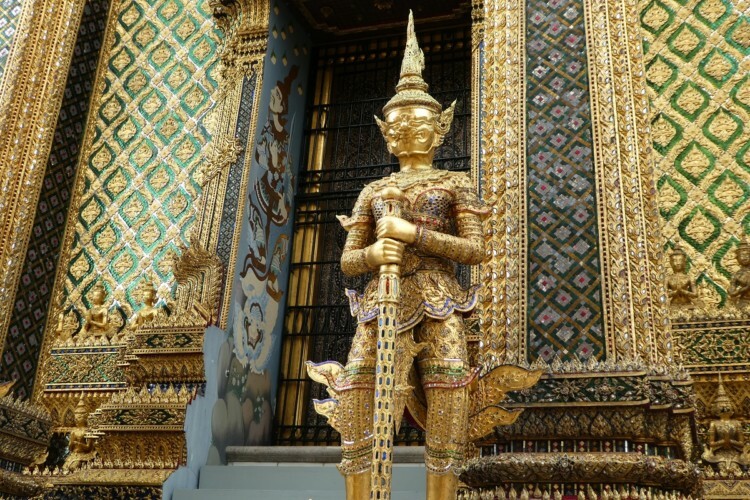 A good primer on Thailand is this overview by TravelingMom Heather B, which contains valuable info about language, food, emergency numbers and more. Destination Asia helped us plan our trip, and we had a really good experience with them. While it’s a splurge, I highly recommend the Peninsula Hotel in Bangkok. The service is extraordinary (I left some clothes in the closet, and they brought them to the airport for me). Plus, their riverside breakfast buffet is gigantic and delicious – enough to fill you up for the whole day. Thailand is a perfect destination if you want to travel with your kids. Aside from this country is safe, there are lots of activities or places that are kids friendly. Just like the elephant rides. beautiful beaches and visiting temples. They’re not just going to enjoy but also learn the Thai culture.